TFI publishes in-depth research reports and papers providing analyses and forecasts of emerging technologies and markets. The topics include many of the non-traditional telephony products and services from the broadcast, cable, computer, satellite, and wireless industries. Many of the publications are sponsored by the Telecommunications Technology Forecasting Group, a consortium of telephone companies comprised of Bell Canada, BellSouth Telecommunications, OFS, Qwest, SBC Communications, and Verizon. Press releases for other TFI reports and papers can also be found under TFI's White Papers, Articles, and Complimentary Reports Press Releases. Austin, Texas, February 2009--Technology Futures, Inc. (TFI) forecasts continued modernization of the local exchange network in the fourth edition of TFI's flagship publication Transforming the Local Exchange Network. According to author Lawrence K. Vanston, Ph.D. , "The transition by local exchange carriers from a narrowband network of circuit switches and copper cables to a broadband network of packet switches and fiber optics is well underway. This transition will largely be complete for the U.S. industry between 2015 and 2020." (See Graph 1: "Deployment of VHS Broadband Fiber."). The report was co-authored by Ray L. Hodges and sponsored by the Telecommunications Technology Forecasting Group, comprised of AT&T, Bell Canada, Qwest, and Verizon. Austin, Texas, March 2008--Technology Futures, Inc. (TFI) announces a new recommended depreciation life of 20 to 25 years for newly-installed fiber optic cable in the local exchange network. TFI's prior recommendation was 15 to 20 years, which reflected the combined impacts of physical mortality, technological substitution, and access line losses due to competition. 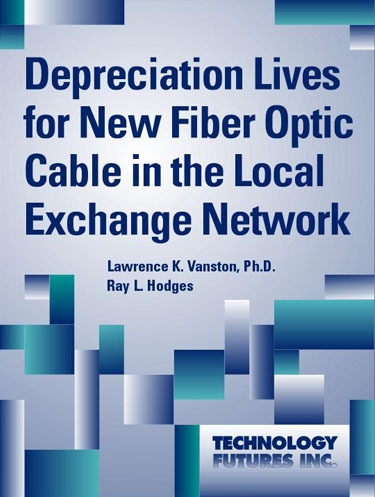 Documented in its new report Depreciation Lives for New Fiber Optic Cable in the Local Exchange Network by Lawrence K. Vanston, Ph.D. (President, TFI) and Ray L. Hodges (Senior Consultant, TFI), this applies to the fiber cable that is going into the massive network upgrades such as AT&T's Project Lightspeed and Verizon's FiOS. The research was sponsored by the Telecommunications Technology Forecasting Group. Austin, Texas, August 2007--Technology Futures forecasts continued increases in broadband speeds, hastening the obsolescence of broadband investment. The report, Broadband Equipment Lives for Local Exchange Carriers, by Lawrence K. Vanston, Ph.D. (President, TFI), presents recommendations for depreciation lives for broadband equipment such as video set-top boxes, headend equipment, and broadband loop electronics, including DSLAMs, DSL modems, and BPON equipment. Discussing the report, author Dr. Lawrence Vanston states, "The business of incumbent local exchange carriers (ILECs) is transitioning from primarily voice to primarily high-speed broadband and video. This means that equipment devoted to delivering broadband and video will come to dominate the useful investment of ILECs. Much of this equipment is significantly different than traditional narrowband equipment and, thus, may have different depreciation lives." The research was sponsored by the Telecommunications Technology Forecasting Group. Austin, TX, July 2007--Mechatronics involves the integration of mechanical and electrical systems with control systems and information technology. These "intelligent mechanical systems" are the foundation of many 21st century enabling technologies. This 130-page publication, Mechatronics, A Technology Forecast, co-authored by Technology Futures, Inc. staff, includes an overview of mechatronic technology and analysis of related occupations and salaries, inventory of existing mechatronic curriculum and considerations for colleges considering developing related programs, and lists of industry experts and mechatronics companies. A COMPLIMENTARY copy of the report is available to you and your readers at http://www.tfi.com/pubs/white.html#mechatronics. Austin, TX, December 2006--Technology Futures, Inc. (TFI) predicts wireless broadband can be economically deployed on a reasonably large scale--perhaps 20% of households--to offer the types of broadband services that DSL and cable modems offer now: that is, speeds in the range 1 Mb/s and relatively bursty traffic. The report, Assessment of Wireless Broadband as a Competitor to Wireline Broadband, by Lawrence K. Vanston, Ph.D. (President, TFI), provides an independent assessment of the potential for wireless broadband to compete with residential broadband services offered by incumbent local exchange carriers (ILECs) and cable companies. The research was sponsored by the Telecommunications Technology Forecasting Group. Austin, TX, May 2006--According to a new report by forecasting and market research leader Technology Futures, Inc., biotech offers a promising array of opportunities for individuals and small and medium-sized businesses, as well as individuals seeking employment. The most promising areas are bioinstrumentation, bioinformatics, DNA and human health, and bioagriculture. Government-sponsored funding of biotech research, and the availability of financial resources and financial incentives for private biotech enterprise development, are rated as the most critical factors to the success of a biotech effort. The report, Biotechnology: A Guide to Business and Workplace Development, was written by John H. Vanston, Ph.D. (Chairman, TFI) and Henry Elliott (Research Analyst, TFI). Austin, TX, March 2006--According to a new report by Technology Futures, Inc.(TFI), incumbent local exchange networks (ILECs) have no choice but to invest in new technology and offer high-speed broadband and video to stay in the game. 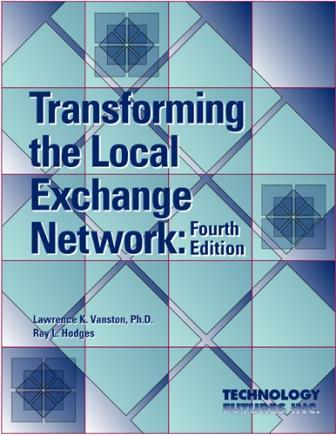 The report, Transforming the Local Exchange: Third Edition, written by Lawrence K. Vanston, Ph.D., (President, TFI) and Ray L. Hodges (Senior Consultant, TFI), presents the latest TFI forecasts for the North American local exchange network covering switching, circuit equipment, and outside plant. It also includes TFI's latest recommendations on depreciation lives for local exchange telephone plants, accounting for technology displacement, and loss of access lines due to competition. The research was sponsored by the Telecommunications Technology Forecasting Group. The events of September 11, 2001 created dramatic employment opportunities for technology- related jobs growth in the homeland security (HS) area. According to a new report from Technology Futures, Inc. (TFI), "Homeland Security: A Technology Forecast," seven technology areas will ultimately make up the technical underpinnings for the nations homeland security agenda, and will serve as major areas of potential employment. TFI is now making available a COMPLIMENTARY copy of this 124-page report to YOU and YOUR READERS at <http://www.tfi.com/pubs/white.html>. (November 2004). Press Release. Texas Press Release. According to a new report, Fuel Cells: A Technology Forecast, the opportunities for those willing to make the necessary commitments to become leaders in the fuel cell field could be very significant in terms of capital infusion and job creation. The 80-page report written by John H. Vanston, Ph.D. (Chairman, Technology Futures, Inc. [TFI]) and Henry Elliott (Analyst, TFI), and sponsored by the Texas State Technical College (TSTC), discusses the fuel cell industry, the different types of fuel cell markets, and the use of fuel cells in electric power production and motor vehicles. The report is available to you and your readers for FREE. (Texas media version) (February 2003). Press Release. Texas Press Release. What is the current state of the nanotechnology? What factors might accelerate or deter development of nanotech markets? What career opportunities are available? This report, written by John H. Vanston, Ph.D. (Chairman, Technology Futures, Inc. [TFI]) and Henry Elliott (Analyst, TFI), and sponsored by the Texas State Technical Colleges (TSTC), offers answers to these questions and more. The 98-page report is available to you and your readers for FREE at http://www.tfi.com/pubs/white.html . (September 30, 2003) Press Release. To arrange an interview with a staff member or request more information about our activities and/or publications, please contact Ms. Carrie Vanston, Media Relations Director, at (800) TEK-FUTR, (512) 258-8898, or by email at cvanston@tfi.com.